– G. Gershwin-F. Nasone: FoggyDay, Voice, Electr. – J. S. Bach-A. Oliva: Allemanda, Flute, Perc. – M. Stern-G. Sandrini: AfterYou, ElGuit. – M. Marmo: Egitto and Cadenza, Violin and Orch. – Biancoli-Gennai-Marangon: Alexandros Dream, Voices and Trbn. 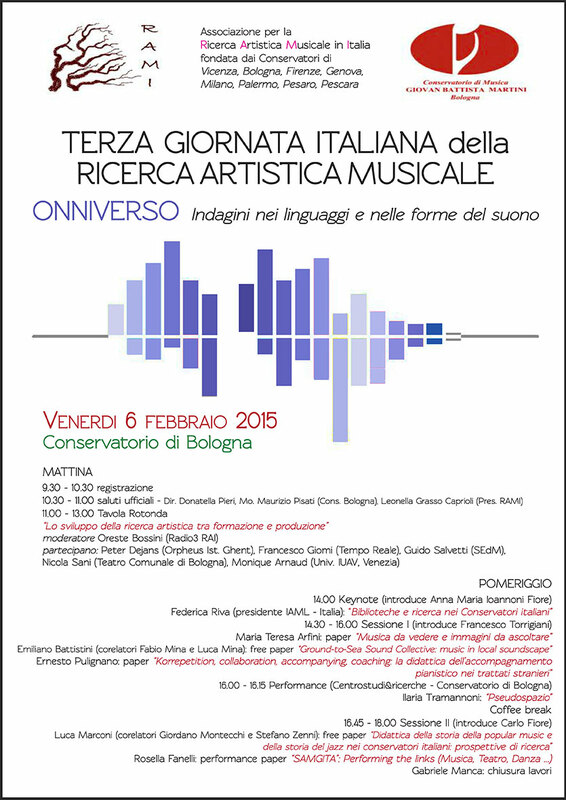 In 2014 I was appointed to found a Music Research structure at Bologna’s Conservatory: CSR-CentroStudi e Ricerche. 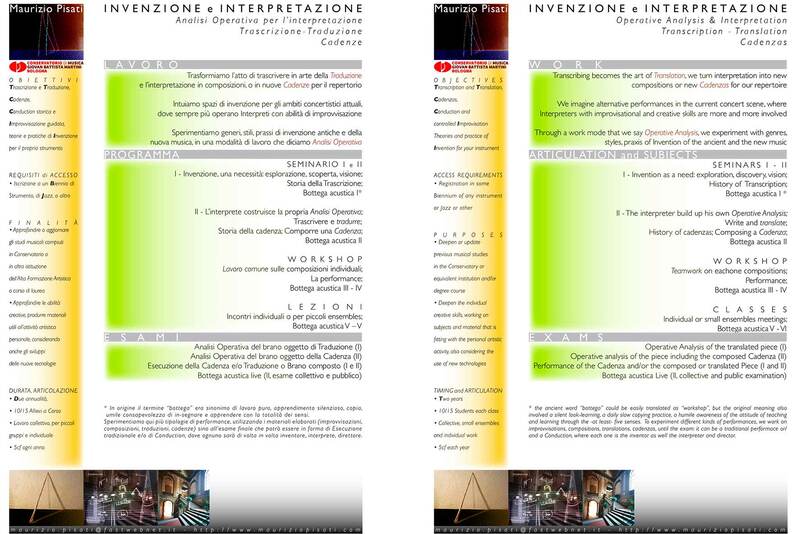 • The activity started on 2015 hosting the meeting ONNIVERSO, with RAMI, italian association for artistic and musical research. 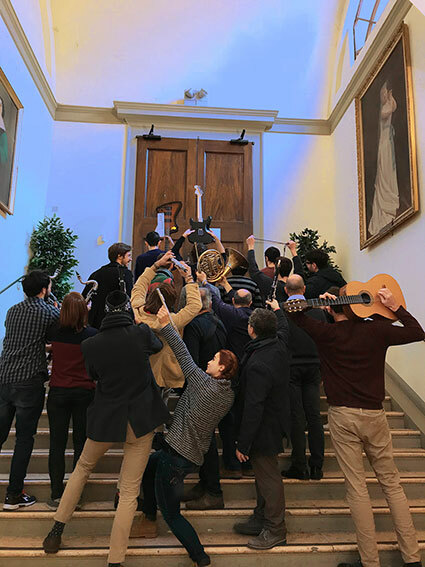 • Then we realized “CAMINAR“, dedicated to the music and the life of Luigi Nono, with guests as Enzo Porta, Giancarlo Schiaffini, Maddalena Novati and Gianni Di Capua. 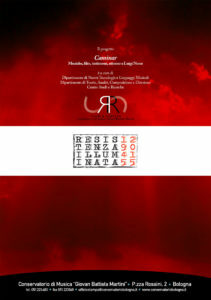 The concerts were part of “Resistenza Illuminata”, a wide series of concerts organized by the municipality of Bologna and its Teatro Comunale as an hommage to Luigi Nono. 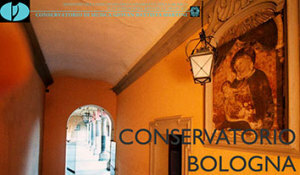 • Meanwhile a proper space has been dedicated to CSR at the Conservatorio G. B. Martini, Bologna. 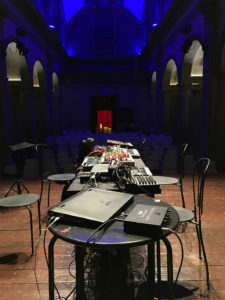 The space has been equipped with some basic furnitures and electronic devices as mixer, nearfield loudspeakers, audio interface, two desktop computers iMac 27″, storage devices and softwares. 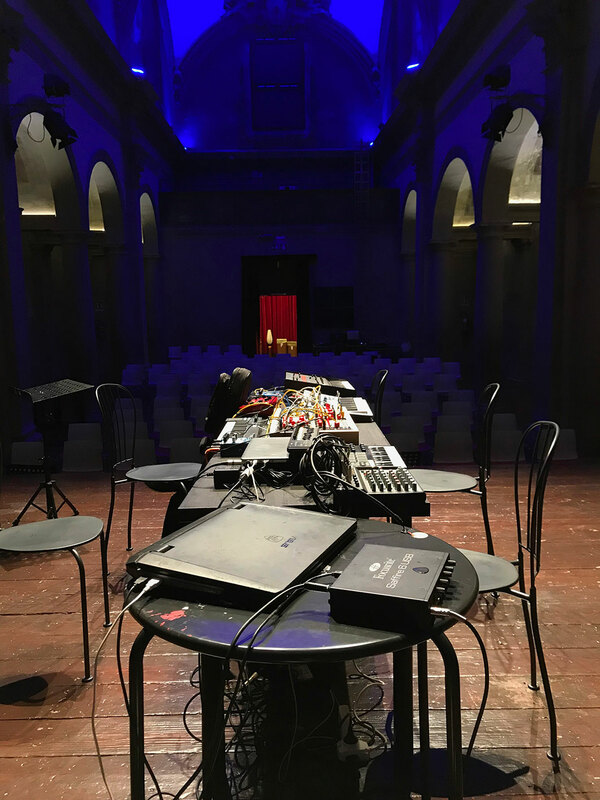 • In 2016 CSR collaborated with AngelicaFestival and INCROCIlab, to realize Conduction e Chimiche Acustiche, as a co-production with Conservatorio G. B. Martini and “HappyBirthdayMrReich“. 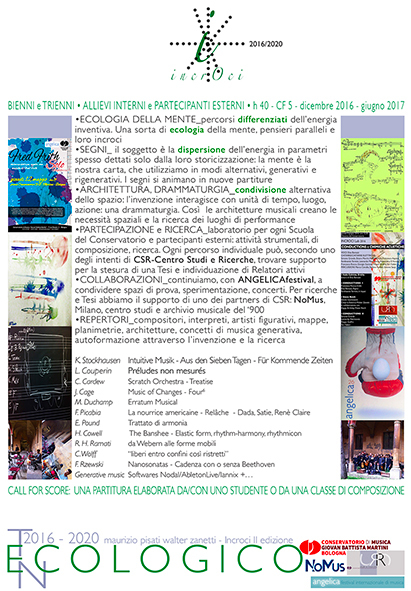 • On 2017 and 2018 CSR continue the work with INCROCIlab for the project “-TN+, Incroci laboratorio TecNologico” and Centro di Ricerca Musicale San Leonardo in Bologna, working with Alvin Curran for his new composition “A BANDA LARGA” at AngelicaFestival 2018. INCROCI, “crossing”, is a laboratory I hold with colleague and Guitarist Walter Zanetti. 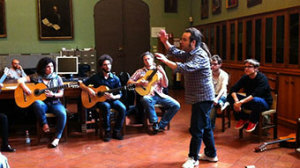 After a performance of IncrocioScarlatto, we started facing each year a new topic about instrumental practices as Improvvisation, Conduction, Domenico Scarlatti, Harpsichord music and Flamenco, ElectricGuitar and electroacustic repertoire, and the work is currently spreading and gathering around a wide range of instruments. • 2015: we went through the repertoire for any instrument and electronics, also guesting a seminar and concert by/with Studio PanAroma and BIMESP, BienalInternacional de Saõ Paulo. 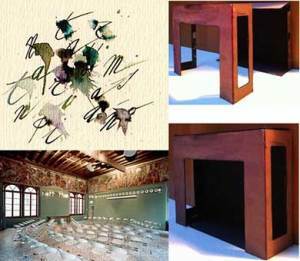 • 2016: INCROCIlab collaborated with CSR and AngelicaFestival, to realize Conduction e Chimiche Acustiche, as a co-production with Conservatorio G. B. Martini and “HappyBirthdayMrReich“. -TN+, Incroci lab TecNologico, again with AngelicA Festival performing the new Alvin Curran’s composition “A BANDA LARGA“, Bologna 2018, and a further concert on dec.2018 at Centro di Ricerca Musicale S. Leonardo, Bologna. Every year the city of Verona celebrates the memory of Roberto Sanesi, poet and author of well-known translations from English poetry and literature. 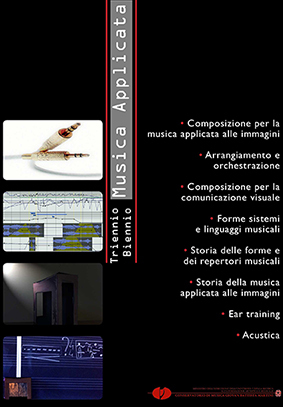 In 2015 the celebration will take place on May 7th, at Sala Farinati, focused on a series of audiovideo storyboards -composed by musicians in one of my classes of department of Applied Music– conceived as suggestions for potential theatrical events, based on a poetry (Senza Data) and painting by R.Sanesi. Basic Trienn ium for Teacher Training. Biennium for Musical instrument Teacher Training; the course developes the matter of musical instruments teaching, with methodological studies, instrumental, pedagogical and psychological, composition, choir and direction, history and finally a third year of intensive training required to get a teaching degree. 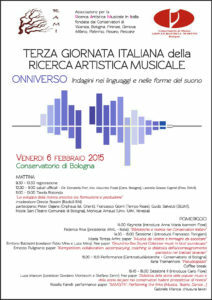 Next: Music-Therapy Triennium and Multimedia Triennium. • LAPTIP, laboratory of Invention and music production for training teachers, a sort of creative updating for teachers already working in primary and secondary school. 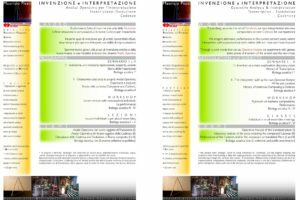 Un incessante rispecchiarsi del cosmo (da Gurdjieff a Stockhausen), by Y. Fabbri, Teach.TrainingDep. Geremia – una tragedia degenerata, by M. Ascari, AppliedMusicDep. Il solo come un racconto, by Matteo Crotti, JazzDep.